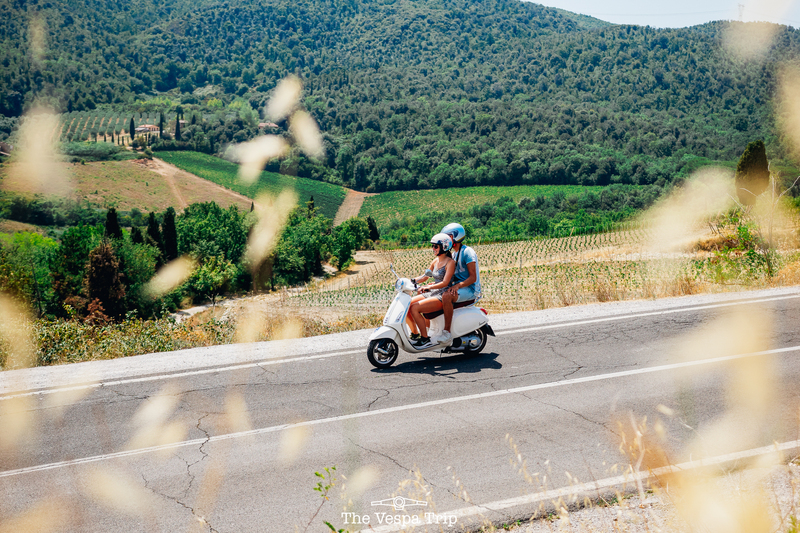 Lately life has been almost on overdrive, Nico and I have been traveling a lot with the Christmas holidays, from France to Istanbul and a weekend in Paris – a lot of what you will see in the blog. Of course it is a lot of fun but also a bit stressful since after all, work never stops and the internet never shuts the heck up. 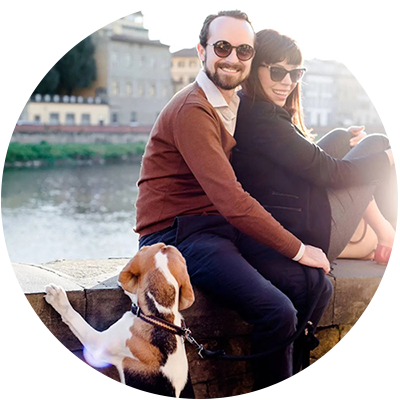 However, when we touch down into Florence and walk across Ponte Santa Trinita towards our small apartment in the oltrarno, I always get that warm feeling of finally relaxing and being home. A pleasant, simple routine is restored, with plenty of coffee (some of which is spilled on my lap) and dog walks between working and meeting with friends. This week has been a little more stressful for us both, I am glued to my computer until Nico gets home around 7:30 – 8 yet what I find immensely relaxing is going on a walk, taking pictures and prying our dog Ginger from strangling herself from the leash as she plays with other dogs. At thirty years old, I am finally embracing the chance to at times be a little ‘cheesy’ with no apologies. I’m not planning on hanging motivational posters in my house anytime soon (that hanging cat is still annoying), but still, just allowing myself to be wowed constantly by simple, everyday life in this city. 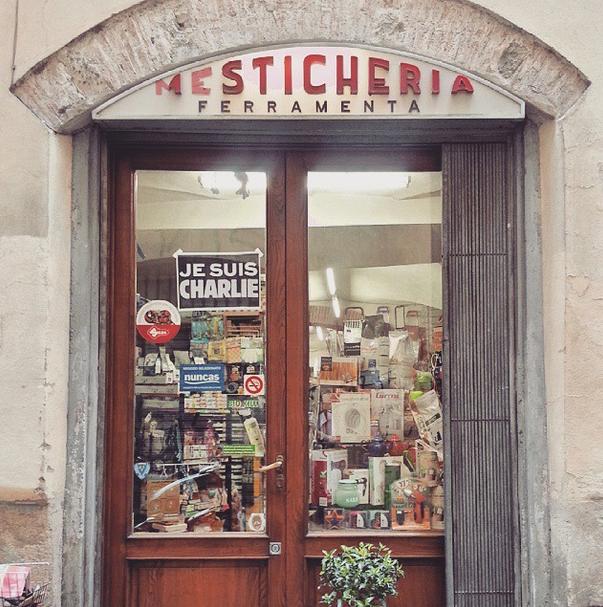 Since it’s Friday and I think we are all more than ready for the weekend, I wanted to share twelve of some of my favorite recent photos taken around Florence. Sunsets, panoramic views and enough bubbles to soap up a water polo team, it’s all here. Enjoy! Nothing strikes me more than peeking through hidden corners in Florence to see something beautiful on the other side. 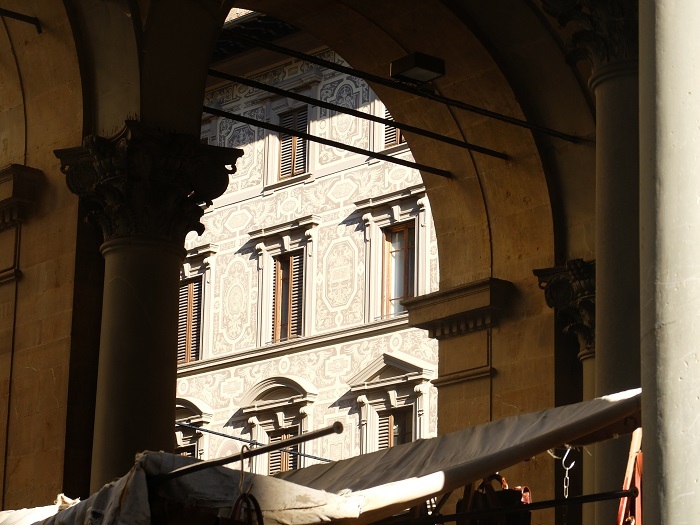 In this case I was looking through the ‘mercato nuovo’ or Porcellino market where I spotted a beautiful building underneath these Renaissance arches above the tarp from the market stalls. Obviously I live in this area which makes for a bit too many photo opportunities from Ponte Santa Trinita but honestly, I could care less. I adore standing under one of the ‘four season’ statues placed at either corner. No matter my mood on any particular day, walking across the cobblestones is nothing short of privileged and I enjoy seeing other’s viewpoints from one of Florence’s most photogenic spots. If you ever have a life question or just want to know how to get a wine stain out of your sofa cover, all you need to do is head to a local Italian mesticheria. A sort of ‘everything’ store where you can pick up dog food, pots and pans, cleaning supplies, any filter or plug you may need and a little ‘local wisdom’ from the locals inside. I adore my local one on via dè Ramaglianti close to the Ponte Vecchio which saves me from way too many trips to the supermarket. An iconic spot in Florence, the stone benches in front of the antique carasoul of the Picci family in piazza della repubblica have held many a behind. Five generations of this family have run this merry-go-round in one of the most famous squares in the city and we all have plopped down to relax or chat with a friend on one of these benches. 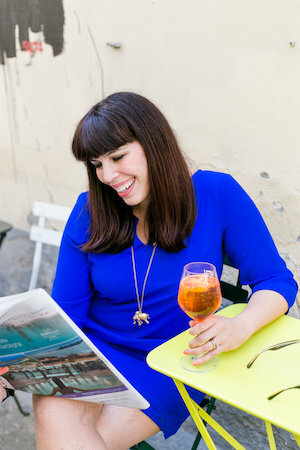 Stopping for a Moscow Mule at Caffe Florian and fun fruit drink with my friend Annie, aka the Scooter Maven, and owner of exclusive private tours all over Italy. 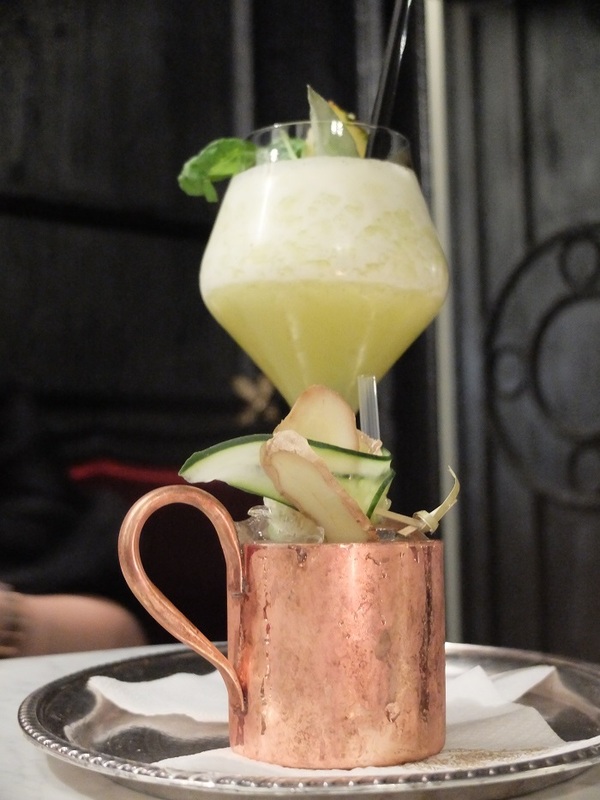 You guys already know how much I adore this vintage 1940’s cocktail with ginger and at Florian they serve several different kinds, my favorite the classic made with ginger beer served in the traditional copper mug. Plus this cafe is so darn pretty, I find any excuse to stop by for tea or a pre-dinner drink. Caffe Florian,Via del Parione 28/r. Close to Ponte Santa Trinita and via tornabuoni. We were all shocked by the tragic events on January 7th at the headquarters of Charlie Hebdo in Paris, France. If one positive thing came out from this very horrific, senseless massacre, was the coming together of people from all over the world, including Florence. 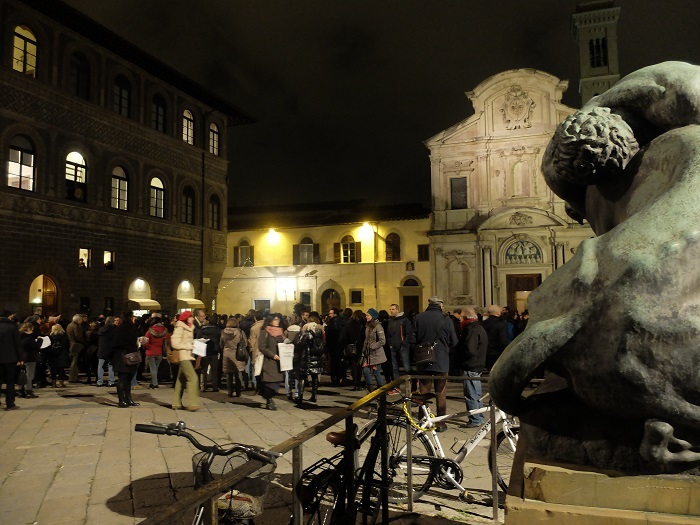 In piazza ognissanti, for several days vigils were held in front the French consulate and institute with #jesuischarlie held up by local journalists and people sharing solidarity with France. 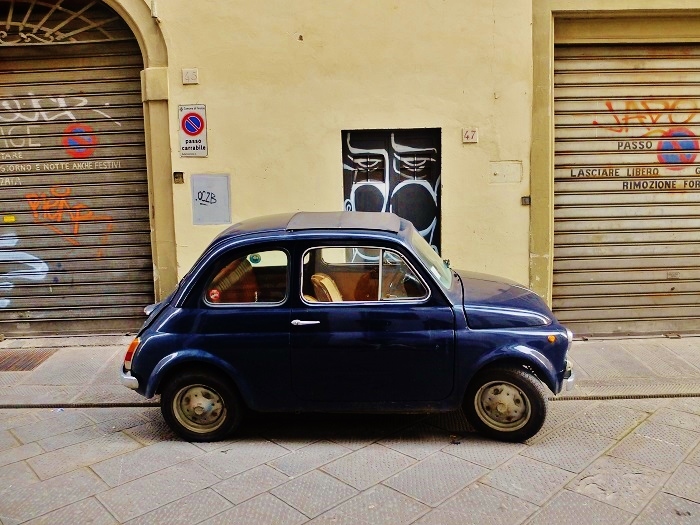 Like pretty much everyone in Italy, I adore a vintage Fiat 500 or ‘topolino’ like the rest of them. The original version was first available for sale in 1936 and now you can even purchase one with an espresso machine (the 500L model). It’s a lot of fun spotting these cute little cars all over the country which is why I couldn’t resist snapping this shot in the streets of the oltrarno. Come to me, little one! 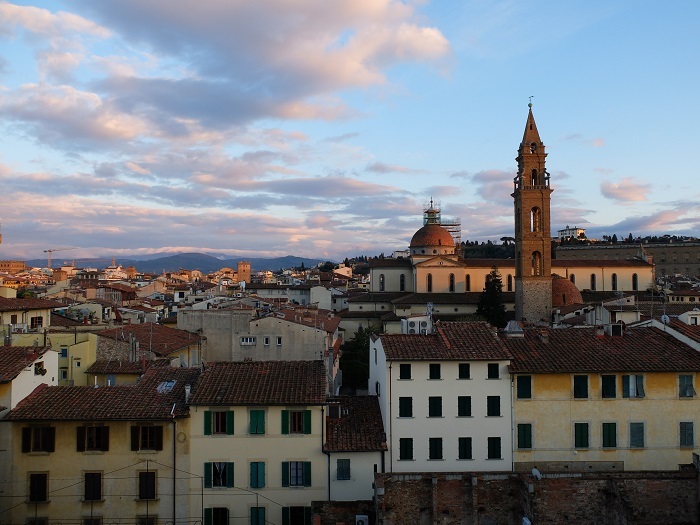 I can absolutely never get enough of a great view of the Florentine rooftops, this one was snapped from the terrace attached to the apartment of a local legend who I had the pleasure of interviewing recently. Walking up over 90 steps isn’t very fun when you’ve just gotten groceries but with this kind of view, anyone would welcome the extra exercise. Firenze come’ sei bella! 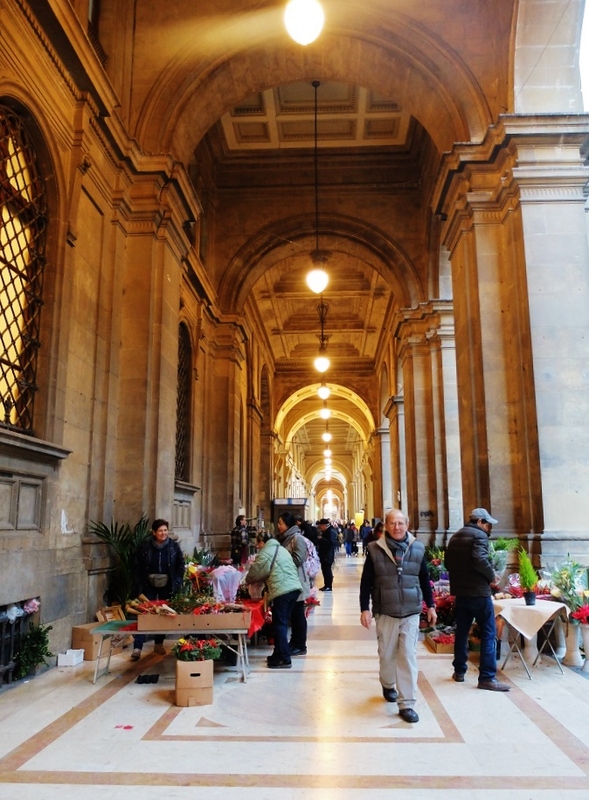 Every Thursday morning under the arches in piazza della repubblica, is a weekly flower market which I always manage to see when I head to the post office located in the same place. Flowers and plants are relatively cheap in Italy so I highly recommend stopping here on Thursdays to see what they have for sale. January means plenty of grey mornings and afternoons, threatening to rain or at least fog over but that doesn’t make it any less beautiful. 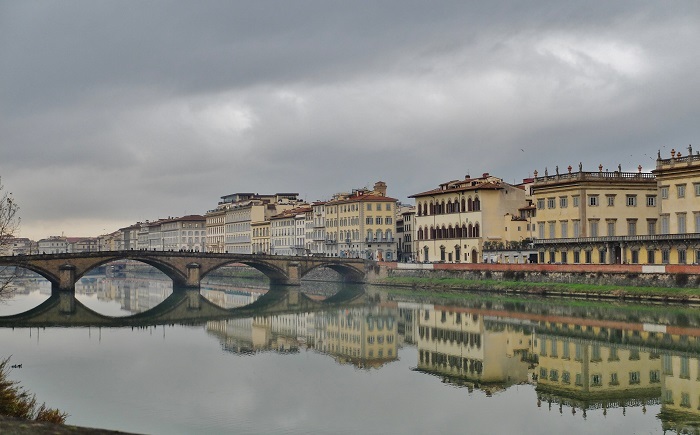 Instead I suggest walking over to the arno river to see the day’s reflections in the water, don’t go for a swim, it’s pretty rancid but the view is untouchable. I have a secret soft spot for guys like the ‘bubbleman’ above. 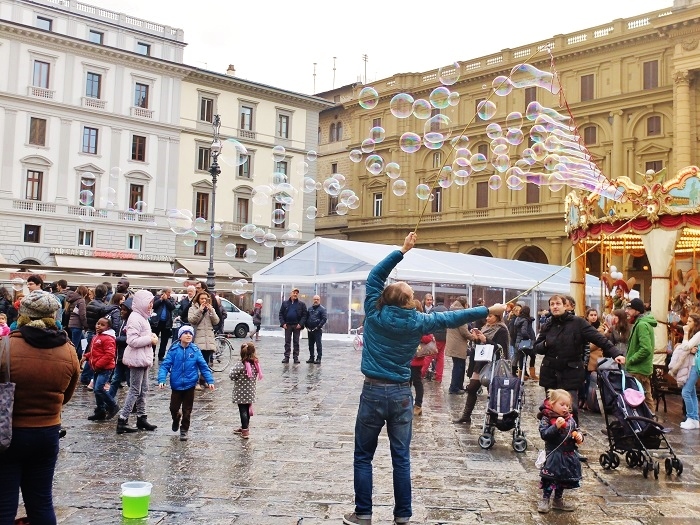 You can often see him waving his soap wand in piazza della repubblica or in the center of via tornabuoni. He works his ‘bubble magic’ for kids and adults alike. This is a guy who really loved his job and brings about plenty of smiles from happy onlookers. Last but not least is the incredible sunsets that every so often, stops everyone in their tracks. Yesterday just happened to be one of those days. 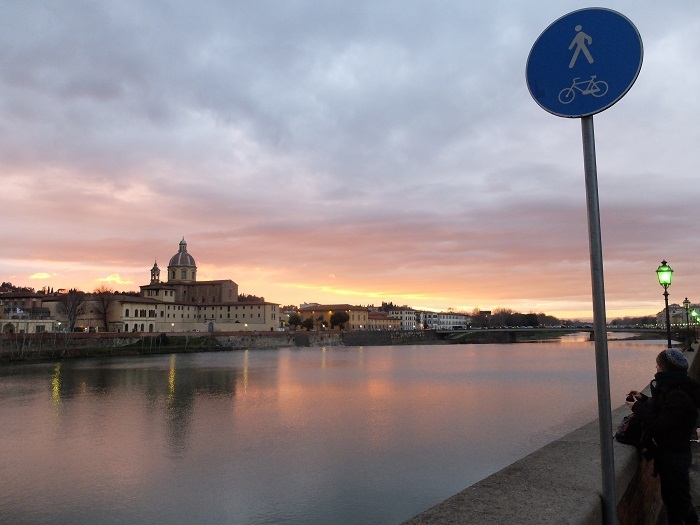 I was walking Ginger along our usual path, towards Cascine park along the arno river and to my delight, the sky opened up in a sea of pinks and yellows. Sunset win! If you like the photos, share them on pinterest and your social networks, I am forever grateful for the support. Find me on instagram and also share some of your Florence photos with me, on my Facebook page, I’d love to see them! Fantastic pictures thank you for sharing them with us! I can never tire seeing such a beautiful city. 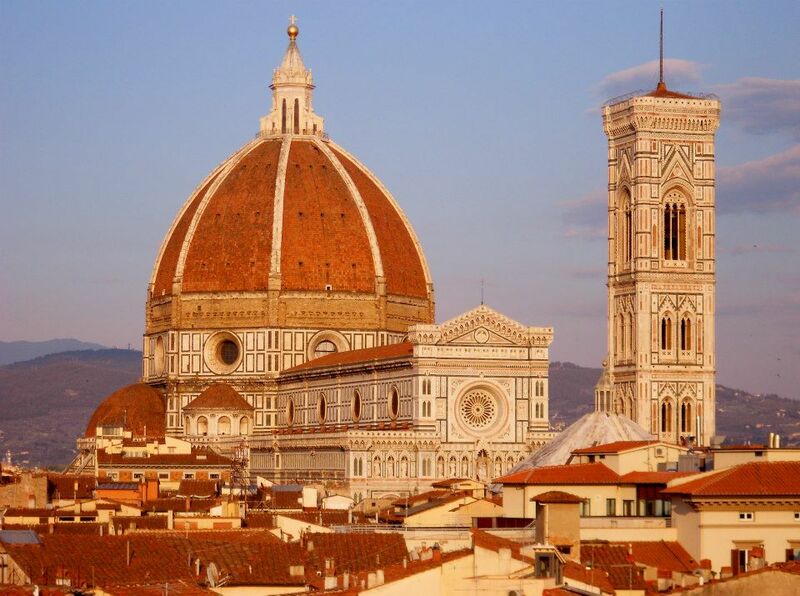 I am visiting Florence on Sunday!! It looks so beautiful, I can’t wait. 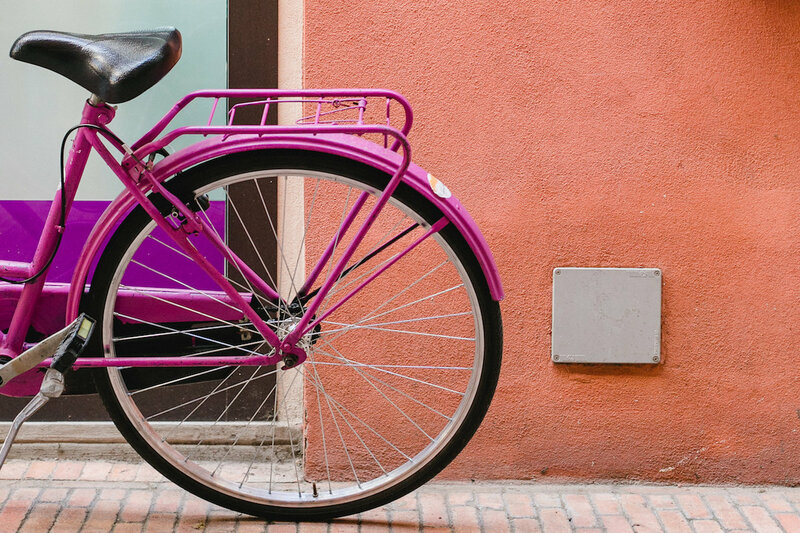 I found your blog just in time too, it’s given me lots of ideas on where to go and what to see and most importantly where to eat! (I really hate getting conned by touristy places). Hopefully the weather will be nice and I can take some nice photos myself! Hello Julie, you are going to have a great time, I am loving January so far this year. I’m always happy to help, it would be (or it should be) an actual crime to eat badly here so any questions you have, feel free to ask! 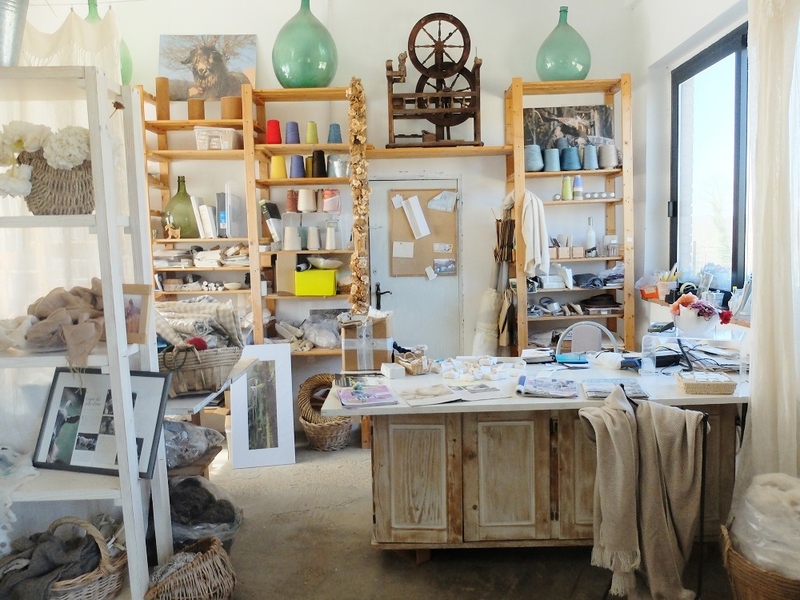 As for good geleteria, I have a good list here http://girlinflorence.com/things-to-do-inaround-florence/restaurantsnightlife-list/. 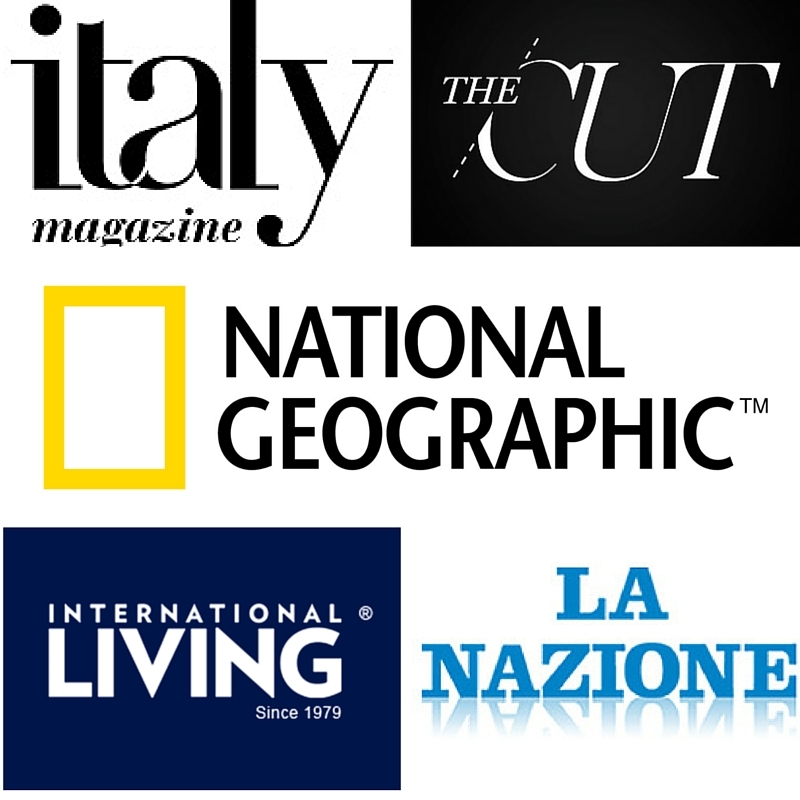 My top favorites are Geleteria della Passera (in piazza della passera), geleteria carapina, Via Lambertesca and la sorbittiera in piazza tasso. Have a great time in Florence! Your posts are always so beautiful and informative I always get excited when they arrive! Thank you for sharing these wonderful photos! Ciao Maxine, thank you so much, your comment means a lot to me. Have a wonderful weekend <3. I'm hoping we get some sunshine! Thanks! 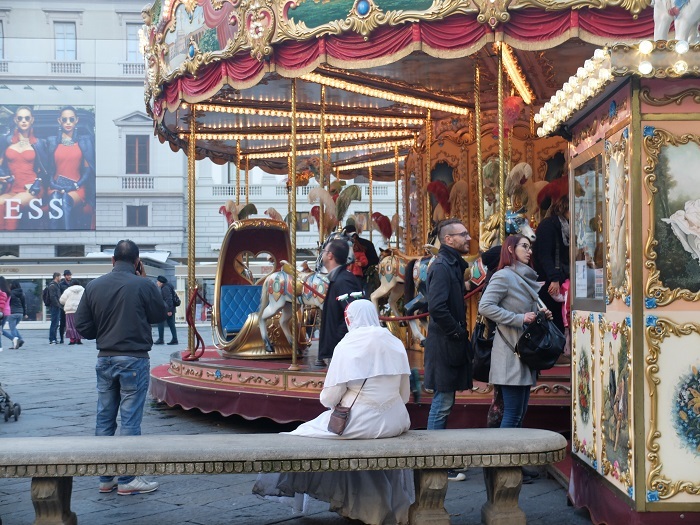 Great photos capturing the mood of Firenze in winter. Lots of memories today! Beautiful photos! Can’t wait to get there in 2 weeks. Do you have any infornation on the chocolate festival taking place in Florence in Feb? I, too, couldn’t care less about repetitive photos taken of or from beautiful spots. There is a vantage point in NYC’s South Street Seaport from which I have taken many photos over the years. Your photos here are gorgeous! Florence never disappoints, from ANY vantage point. Sigh…what a nice collection of diverse images, including ones that make my heart go pitter-patter. 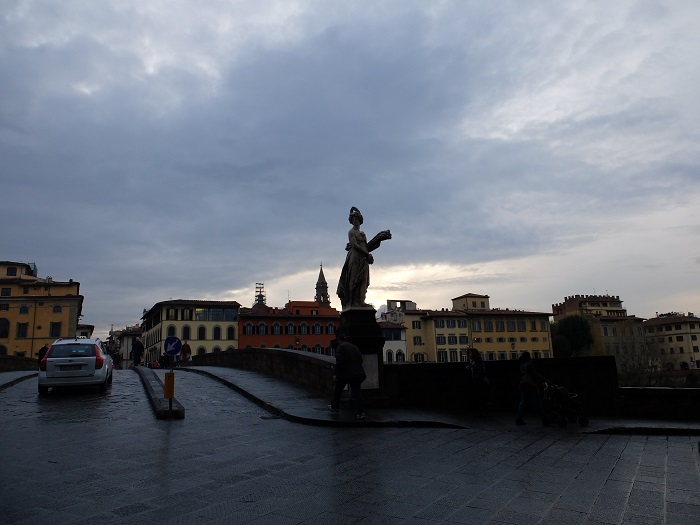 When I studied in Florence and then spent a month there the following year, I stayed on Via dei Serragli and walked across Ponte Santa Trinita every day.